Thunder on the Right by Mary Stewart ~ 1957. This edition: Hodder Paperbacks (Coronet), 1974. Paperback. ISBN: 0-340-02219-1. 255 pages. Omigosh. This book. Words (almost) fail me. 110% gothic romance, and absolutely bizarre in plot and execution. Luckily I’ve been on something of a Mary Stewart binge recently, and this came along as book number six; if it was number one or two I doubt I would have had the heart to continue. I try my hardest, in reviewing anything in the mystery-suspense line, to not include any spoilers, but, in this case, all bets are off. Consider yourself forewarned! For who should appear but a figure from Jennifer’s past. Up pops handsome Stephen Masefield, an old student of Professor Silver’s. Jennifer has dallied with Stephen in Oxford days, and he has long cherished a secret passion for the lovely Jenny despite her mother’s brusque dismissal of his courtship, all unbeknownst to the innocent maiden. Stephen comes with an intriguing past, and is dashingly handsome despite his slight limp from an old war wound (this is all taking place post World War II, in the mid 1950s or thereabouts) as well as exceedingly talented, both in music and as a skilled amateur artist. Lots of details, yes, I know. But every single one of them matters in the upcoming narrative, for this is an exceedingly busy story, chock full of details affecting details, and coincidences and lucky (or unlucky) juxtapositions of people and events. I’ll cut to the chase, if I may, and give the barest outline of the action to follow. Jennifer goes to the convent, meets a sinister Spanish nun dressed in a silken habit and sporting a flashing ruby-encrusted cross, and is informed that her cousin was indeed in residence, but that she has died and is buried in the convent graveyard. Something about an automobile accident, and crawling up to the convent gates after midnight, and devoted nursing and a sudden decline… Jennifer is in shock and visits the grave, where a glimpse of a bouquet of gentians sets off a train of speculation in her mind. Perhaps Gillian is still alive, and a mystery woman is buried in her place…?! Beware the nun! An older paperback cover which captures the mood so very well. The plot convolutes on its merry way, involving a rare form of colour blindness (Gillian would not have been able to identify gentians as her favourite flower – she cannot distinguish blue), a beautiful young novice who nursed Gillian, a stunningly gorgeous local youth dashing about on a wicked stallion, the aforementioned sinister Spanish nun, the extremely old, kind and blind Mother Superior who is unaware of the fact that the Spanish nun, her bursar, is filling the convent with war-looted treasures (solid gold fittings, altar pieces by El Greco, jewelled statues, etcetera), a local smuggler in cahoots with said nun, a vitally crucial letter found tucked behind a picture – this coincidence put me off the story early on – absolutely contrived! – midnight forays by everyone generally ending in eavesdropping on startling conversations, a mystery woman in a mountain cottage, multiple thunderstorms (“thunder on the right” – aha! ), a landslide, a flash flood, a slender rock bridge over a ravine, the heroine’s habit of delicately fainting at crucial moments, Stephen’s multiple heroic accomplishments – mastering the wild stallion! hand-to-hand combat skills! great kissing! – on and on and on we go. The girl in the mountain hut is Gillian; the little novice goes off with her handsome horseman; the evil nun and the smuggler meet their comeuppances; the woman buried in the nunnery garden is the criminal alluded to in casual conversation early in the story. Jennifer is passionately kissed not only by her dashing swain, but by the testosterone-drenched smuggler, who manages to keep his carnal urges on a high boil even while fleeing for his life when the predictable dénouement occurs. Moments of lovely writing – Mary Stewart does excel at her descriptions – and snippets of humour here and there did not make up for the messy, too-busy, coincidence-heavy plot. Jennifer is the most unbelievable of all of the Mary Stewart heroines I’ve met so far – the others have been very likeable – and I found her utterly annoying. The whole thing was too full of heaving bosoms – can even a nun have a heaving bosom? Well, yes, apparently – and surging stallions and heavily gothic settings. Too much! I have been soothing myself with a return to sedate O. Douglas, and am now reading Eliza for Common with relief. Thunder on the Right has rattled me badly, coming as it did after Mary Stewart’s rather more excellent My Brother Michael, which I have yet to review. I liked that one a whole lot more. I’m glad I read it, though, if only to contrast with the rest of the author’s works. It is indeed interesting to see her development as a writer over the course of her career. I’m only read six of the novels so far, and I’m definitely seeing a pattern of evolution. Very interesting. 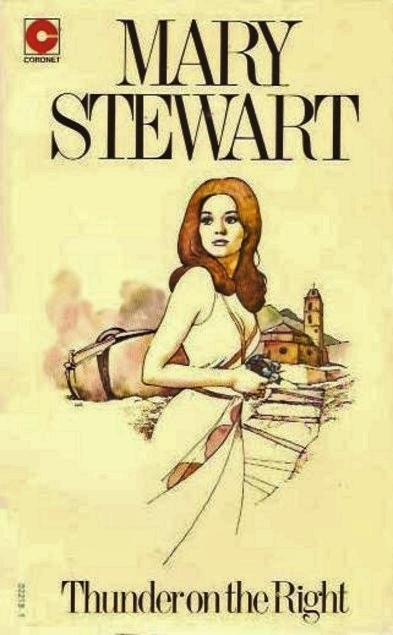 I intend to continue to explore the vividly painted, action-packed worlds of Mary Stewart, though I may have to take a bit of a break to regain my equilibrium after this latest foray. That’s hilarious! 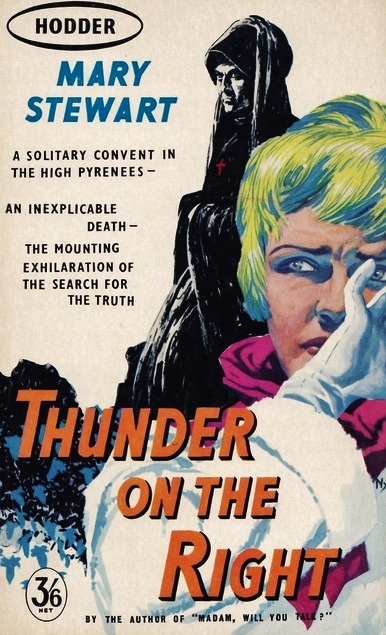 I had no idea Mary Stewart felt that way about Thunder on the Right. It’s my least favorite of her novels too. I laughed out loud when I read that snippet. It wasn’t just me! Even the book’s author shakes her head! I could see where it was going, but it didn’t really come off. Purple prose, indeed! I know you meant it negatively when you said “absolutely bizarre in plot”, but I read that and immediately thought OH GOOD I LOVE BIZARRE PLOTS. Having read the full review in a more sober frame of mind, I do recognize that I should not probably make this book my introduction to Mary Renault; but really, I love bizarre plots very very much. Not a bizarre plot in a good way – just in a poorly executed, “You’ve got to be KIDDING!” sort of way. Too many coincidences. Heroine wanders into the convent chapel, looks around, and out of the blue decides to slide her hand under the frame of a random picture, where she finds tucked a signed letter which is Evil Nun’s blackmailing hold on Wicked Smuggler. Really, dear author? REALLY???!!! And much more of that ilk. Your review cracked me up! I just checked, and this isn’t one of the many on my TBR shelves – nor will I be looking for it, though the crazed Spanish nun in the silken habit is very tempting. “(Jennifer’s) illogical feeling of discomfort persisted. Faced now as she was by one of the inmates of the convent, this woman who stood quietly in traditional medieval garb against the austere simplicity of white walls and unvarnished deal, she should surely have been able to dismiss her earlier tremors as absurd. Why, then, should the appearance of the woman realize rather than quell the senseless unease of the past few minutes? “Then the Spaniard’s hand moved from her sleeve and came up to touch the cross at her breast, and Jenifer understood, if only with a deepening puzzlement. On one of the long white fingers glowed a big ring, an amethyst, its colour blandly feminine against the black tunic. As Jennifer’s eyes, faintly shocked, followed the movement of the ring, she saw, too, that the tunic and robe gleamed with the unmistakable heavy sheen of silk. The veil was of silk, too, as fine as lawn. Bizarre plot and odd title! And oddly there is a Marghanita Laski political satire called ‘Tory Heaven or Thunder on the Right’ published a few years earlier in 1948. See http://catalogue.shu.ac.uk/record=b1675756~S1a for a plot summary. Very odd title. For some reason, before I started reading, I had the idea that the plot involved car racing. Not sure where that idea came from! But that is what the title suggested to me. Oh, and there is an overturned car on the cover of my paperback edition. Interesting link to the Laski satire. Thank you!